The Nursing department provides appropriate, compassionate, quality-patient care for all patients who come to Dr.Jeyasekharan Hospital & Nursing Home. 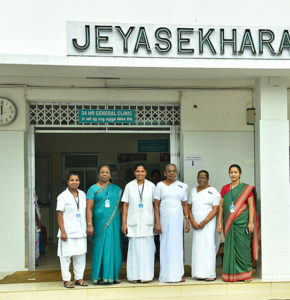 The Nursing service of Dr.Jeyasekharan Hospital was established in 1965 and plays a vital role in enabling “Competent, Compassionate, Knowledgeable and Professional” health care delivery to all. The first nurses, Mrs.Anselina Raj and Mrs.Roselet Chellappa and today’s Nursing Superintendent and Deputy Nursing Superintendent of the hospital, with their support, the department grew by leaps and bounds through the years under the headship of committed and able Nursing Superintendents. Nursing values human life and maintains the patient’s diginity, privacy, confidentiality and rights at all times. Care is provided by a highly trained and competent staff, patient care, patient education, nursing management and administration. The nursing services department continually educates and trains the nurses; thereby enabling them to provide “quality care” to individuals of all ages, with an aim to promote health and prevent illness, to restore health and alleviate suffering. Mandatory certification in life support is required for all staff, which includes BLS, ACLS, PLS and NLS.